The showground management has again agreed to offer discounted tickets to Societies at the bargain price of £8 per day. This admits people to both the Orchid Show and to the very popular Royal Three Counties Show. Tickets are not dated so there is no need to specify which day you are planning to visit. Buying tickets in advance is recommended to avoid paying the full price (£25 on the day). However, it is important to note that these tickets are not for resale under any circumstances, a problem in the past. To purchase tickets please send a cheque immediately, made payable to O.S.G.B. and send to Sally Mill, Treasurer, with a stamped addressed envelope for returning your tickets. Deadline for ticket requests is 1st May. OSGB will be exhibiting at the Show. Can members please help by contributing plants, contact Galina if you can provide plants. NB. Each £8 ticket covers one full day at the show; they are not dated and can be used on any one of the three days. The aim of these tickets is to get orchid lovers (plus family and friends) to the Show. These discounted ticket orders are made by Societies and not individuals. We are very pleased to announce that Baycroft Care Homes & Senior Villages, a subsidiary of One Housing Group Ltd, has very kindly agreed to sponsor our 2019 Chelsea display. Baycroft Care Homes provide luxury residential, nursing and dementia care homes and senior villages. They also offer respite care. More information about them can be found on www.onehousing.co.uk Head Office: 220 Arlington Road, London NW1 7HE. We are delighted to be associated with them and are honoured that they have chosen to sponsor us. 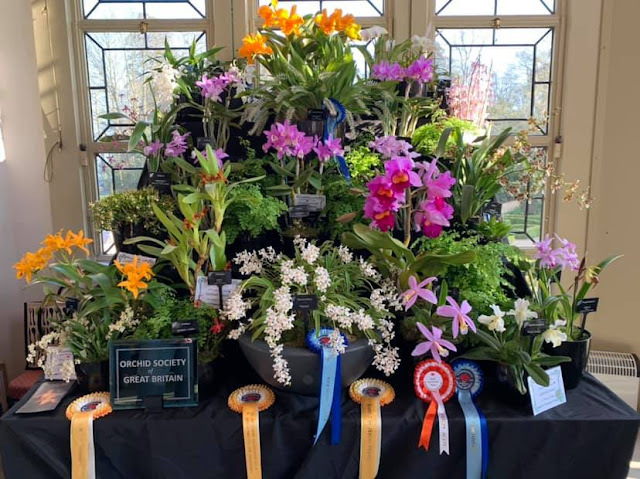 At Bournemouth Orchid Society's 60th Anniversary Show, staged at Highcliffe Castle (30-31 March 2019), the OSGB received multiple awards including Best Amateur Display. In the ribbon judging Sally Mill's Sarcochilus fitzhart (below) was awarded the Best Amateur Plant and Best Plant Exhibited by a Bournemouth Orchid Society Member. See full report in OSGB Journal. Bala will discuss some of the flowering orchid highlights from the Royal Botanic Garden. 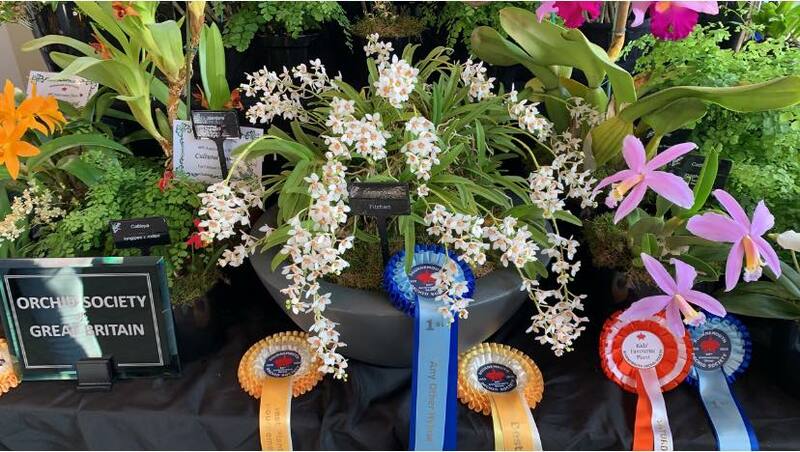 Chris Purver from Eric Young Orchid Foundation will discuss state of the art orchid hybridisation. Simon Pugh-Jones from Writhlington School with give us a talk on growing cool orchids. Plants will be available for purchase. Members may each bring four plants for sale, or six for family membership, to be auctioned. Note: if you want to put several plants in a tray, as a single auction item, this counts as one "plant". 10% of sale price goes to the OSGB. Henry does his best to ensure that bidding is brisk, and prices are affordable. There will be no table show this month.